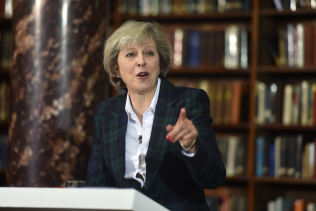 Conservative Councillors have stated their preference for Theresa May to be the next Conservative Leader in the latest Survation poll, fieldwork of which was concluded before the results of the first ballot of Conservative MPs was announced on Tuesday evening, and was featured on the Daily Politics. 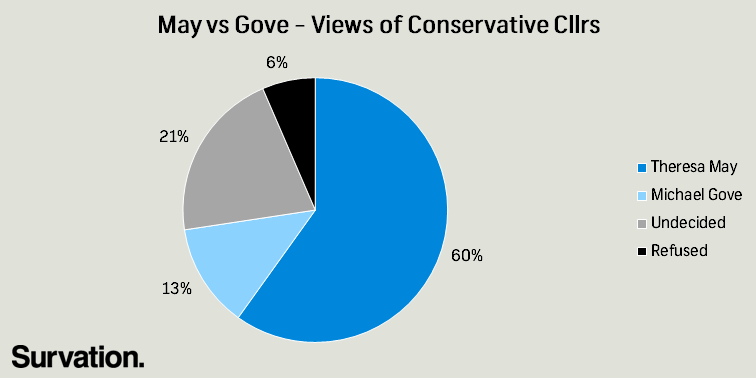 Nearly half (46%) of Conservative Councillors said, of the five leadership candidates, Mrs May was their top preference. Excluding those who were undecided and refused to give an answer, three-in-five (60%) Cllrs backed Mrs May, compared to just over a quarter (28%) who backed her closest rival, Andrea Leadsom. Those Cllrs who stated a candidate other than Mrs May as their top preference were then asked who they would choose in a series of head-to-head contests with Mrs May, in order to replicate as best as possible the membership ballot paper which Conservative Cllrs will receive once the field has been whittled down to two. In light of Liam Fox being eliminated and Stephen Crabb dropping out of the leadership race last night, our tables only feature head-to-head contests for Theresa May against Michael Gove and Angela Leadsom. Survation interviewed 1,062 Conservative Councillors on 4th – 5th July 2016. Full tables available here.